Welcome, knitters and other crafty/thrifty/ethically conscious types, to the first instalment of my new knitting blog. Here will be discussed the merits of reclaimed yarn, what you can knit with it and how you can get it, amongst other things. About a year ago I discovered the marvels of unravelling old sweaters, not only providing me with an almost unlimited supply of gorgeous yarn, but eliminating my ethical quandaries concerning the purchase of new yarn. Soon I found I almost enjoyed unravelling more than actually knitting... And, that I had more unravelled goodies than I knew what to do with! So I decided to start selling my excess stash - which developed into actively purchasing and unravelling sweaters to sell. Check out my Etsy shop: Rewound. 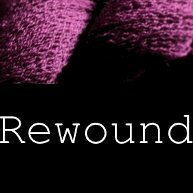 So I am writing this blog to document my unravelling adventures, offer up potential patterns and tips for reclaimed yarn, show off my own FOs, and post tutorials on all aspects of reclaiming. I look forward to reading your comments, answering your questions and making some new knitting friends!